Forgive me having been out of touch the last few weeks, a lot happening over here beyond Lost in the Louvre, but with any luck the blog schedule should be back on track! Here in the US of A today is the day we set aside to appease and apologize to our mothers for the lack of suitable attention throughout the rest of the year. I could not find any good stories about a forger who was a mother, so I went with a fake portraying one of the more famous mothers in history. Artist Unknown. The Virgin and Child with an Angel, 19th century copy. 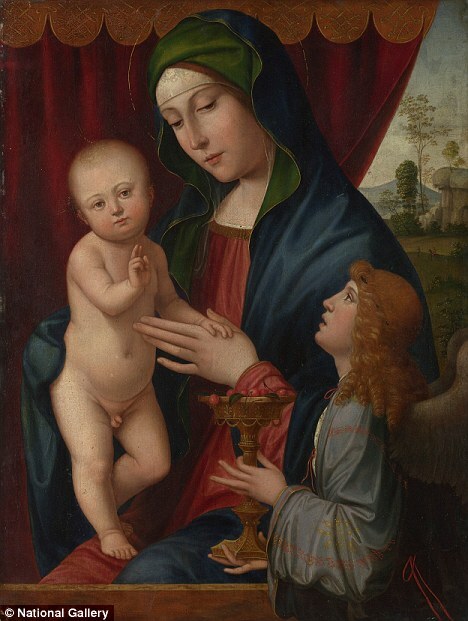 The Virgin and Child with an Angel has been owned by the National Gallery in London for nearly a century, and was considered to be a fine example of the work of Francisco Francia (1450-1517) a Renaissance painter usually overshadowed by the other more famous artists of his era. Even in the 1950s, when a finer example of the same subject by Francia was discovered (The Virgin and Child with an Angel now in Pittsburgh, PA), the National Gallery still thought of its’ own version of the painting as an authentic work by Francia. That is, until 2010, when routine tests to study the layers of the work revealed that the pigments used would only have been available in the nineteenth century, and that even the preparatory sketch was made with graphite, a material unheard of in the Renaissance. It has now been concluded that this painting is a direct copy in fact of the example in Pittsburgh. But never fear! The painting still got a moment to shine before being relegated to storage, and was displayed as part of the eerily well timed exhibition Fakes, Mistakes & Discoveries that took place that same year.